The Trent Institute for Learning and Teaching (TILT) and Centre for Academic Development and Quality (CADQ) warmly invited Course Leaders to attend this day of practice exchange. The TILT Course Leader Conference was held on Tuesday 9 April 2019 in the Teaching and Learning Building at our Clifton site. The theme for the conference was ‘Fairness in Assessment: Design and Practice’, and the day explored this theme and showcased innovation at NTU. Professor Edward Peck, Vice-Chancellor, and Professor Eunice Simmons, Deputy Vice-Chancellor – Academic and Student Affairs, opened the conference with updates on matters relevant to course leaders, including strategic developments as we continue to feed into planning for NTU2025. We were delighted to have a keynote presentation from Dr Naomi Winstone, Head of the Department of Higher Education at the University of Surrey. Naomi integrates innovative teaching methods and formative assessment into her lessons to improve learning amongst students, and has influenced practice across the sector through her research on student engagement with feedback. Naomi addressed ways to move feedback forwards in higher education and lead change that genuinely enhances the student academic experience. 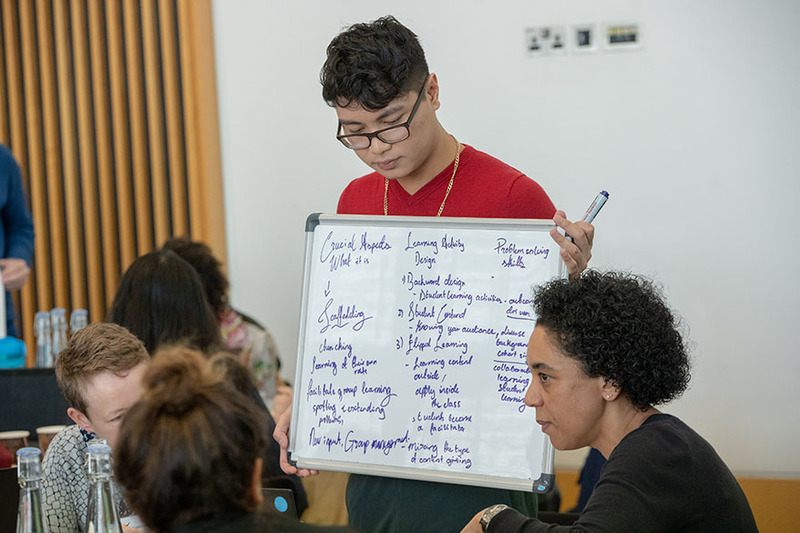 This day of practice exchange aimed to inspire and empower course leaders to explore the role, share ideas, support peers and gain practical skills. Please click here to view the Abstracts Booklet as a PDF. Rachel Challen, Marcus Elliott and members of the TILT Flexible and Online Learning group. Alternative assessment formats in sustainability education: a fair trade? Student improvement or grade inflation? NTU’s position and what you can do to support it. Co-creating and co-designing course content and assessment with students. How to help students think about course design and assessment: tools and questions. Formative assessment: a diagnostic tool for graduate attributes. Research informed teaching as a framework for first year transition into university life and peer assessment in non- outcome based learning. Becoming an external examiner: the Degree Standards Project. Using IT to support effective run-time assessment judgments. Babel or Babble? : How fair is the use of Google Translate by international students in assessments and learning? The effective use of Poor Academic Practice (PAP) warnings. Teaching & assessing oral skills to improve employability. Bringing students to the centre of developing and delivering assessment and feedback. How can the use of varied exemplars help Direct Entrant students better understand assessment guidelines and criteria? Trouble at mill: pedagogic responses to the threat from custom essay writing services. Supporting social work students with additional needs when on placement. Responding to student feedback around feedback: The role of a development group. Including an interactive, informal listening session to seek information and share reflections around the NTU2025 strategy discussions. Please use the north gate entrance at Clifton Campus where you will be directed to guest parking.